Brenda Burgess was born in Birmingham. After attending Art College she moved to Leicester and worked as a Designer/Pattern Cutter. In 1969, Brenda moved to Crawley with her husband Bob. Councillor Burgess graduated with a B.Ed(Hons) at the age of 44 and became a Key Stage 1 and 2 teacher. She now works as a supply teacher and designs and makes bridal wear for private clients. 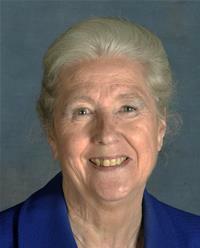 In 2004, Brenda was elected to the Council. She has a keen interest in education and has served on the governing bodies of two schools. Councillor Burgess is also involved with Staying Put, an organisation that supports people in their homes. When Brenda manages to find free time, she enjoys the theatre, amateur dramatics, yoga, pilates and belly dancing. Brenda is married to Bob and has two grown up children.